Where Talent and Training Meet Opportunity! 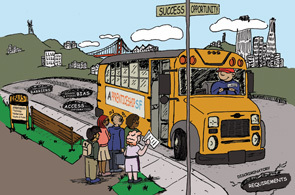 ApprenticeshipSF is offering quality apprenticeship programs for the City & County of San Francisco. A Paycheck. From day one, the apprentices earn a paycheck that increases over time while learning new skills. Working for the Bay Area’s Top Employer. The City and County of San Francisco is proud to offer a growing list of registered apprenticeships. A Career. A graduating apprentice makes his/her way to a successful career, competitive salary, and no student debt. National Industry Certification: A graduating apprentice from our registered apprenticeship programs is certified as a journey-level professional in that specific skilled craft or trade. This certification is valid anywhere in the U.S.
ApprenticeshipSF is helping the City meet the growing need of skilled workers. Don’t let pot holes in the road stop you from reaching your goals. Get On Board and travel the pathway to your future in Tech/IT, Crafts, Trades, and Service Industries.